ENGLAND ― An egg-shaped vessel once used as a floating residence is now a traveling exhibition. The idea of the egg-shaped floating home was hatched several years ago by British artist Stephen Turner. Turner teamed up with Space Place & Urban Design (SPUD) and architects PAD Studio to design the Exbury Egg, named after the Beaulieu River, previously called River Exe, in the Hampshire region of England. A boat builder, Paul Baker, and naval architect, Stephen Payne, were also involved in the creation of this vessel. The vessel was shaped as an egg to symbolize life in a changing environment. “If the ‘Exbury Egg’ symbolises fertility, birth and renewal, it is, equally, a reminder of our difficult relationship with nature and of the heavy footprints that mark our path as we bestride the planet,” Turner was quoted as saying. 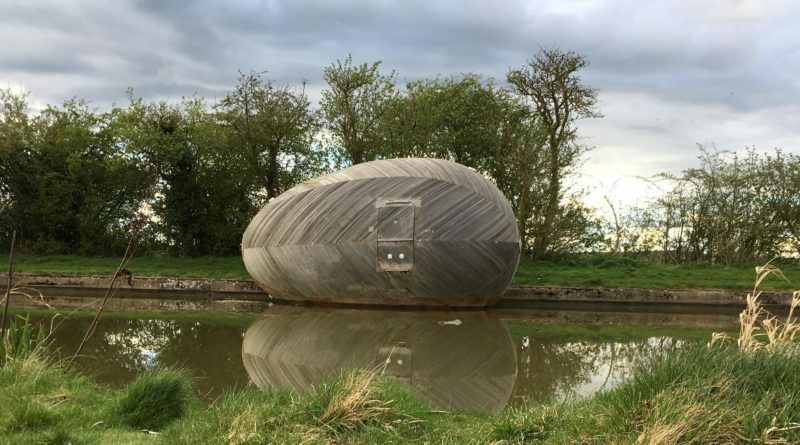 Turner lived and worked in the Exbury Egg from July 15, 2013 to July 14, 2014 to prove a point: dwellings can be designed to have little environmental impact and endure rising tides. The egg-shaped vessel goes with the flow of water while floating on the river and tethered to the land. The solar powered Exbury Egg contains a desk, stove, bed, wet room and skylight. “It took boat builder Paul Baker six months to build the space. He used 8 [kilometers] of cedar to complete it and says trying to get wood to bend round a sphere template was difficult,” according to the United Kingdom’s DailyMail.com. The cost to build the egg was 40,000 Euros (more than $45,000). Arts Council England National Lottery, Paul Hamlyn Foundation, Barker Mill Foundation and Hampshire County Council provided funding for the project. The current exhibition – “Everything Comes from an Egg” – is at Aspex Gallery in Portsmouth, England, with the Exbury Egg located nearby in Gunwharf Quay.